The trick to any movie-going expedition is finding the best seat. 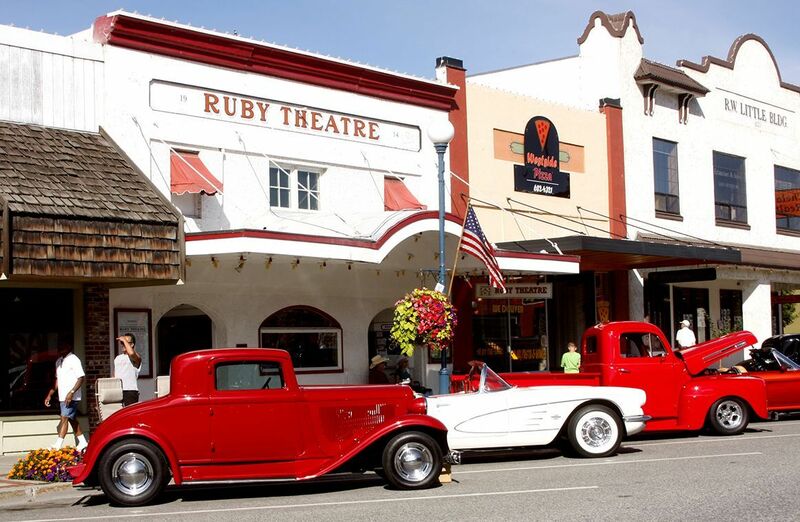 At the historic Ruby Theater in Chelan, Washington, you won’t find it near the front, where red velvet hangs heavy from the stage, and a golden carved arch frames the screen, or even upstairs, in one of the sweetheart chairs at the end of the horseshoe-shaped balcony. The best seat is locked in the back of the building. In a hard-to-find, crowded eight-foot-square fireproof booth, where a puzzle of tiny square and rectangular windows overlooks the auditorium below. Sit, enjoy the view. Then imagine pushing rewind for a show that flickers back more than 100 years. But proceed with caution. A strip of movie film hangs from the ceiling to the right, over the old projector. The dangling film once served as a canary in a coal mine of sorts. Nitrate film, used until the mid-1950s, could be explosive. When paired with exceedingly hot light sources used to project a film’s image onto a movie screen, the film was a constant fire risk. If a strip began to sizzle, it was a siren blare warning of a blaze so volatile it could burn under water. Flame destroyed most old film reels in the nation in the first half of the 20th century, and it was the demise of many early theaters. But the historic Ruby, almost 105 years old, survives as the oldest continuously running movie theater in the northwest United States, thanks in part to its fireproof projection booth – where there have been at least two fires - and a long queue of dedicated townspeople. The Ruby was ahead of its time when it opened its doors, he continued. Less than a decade had passed since two men opened a five-cents-admission movie theater named the Nickelodeon in a Pittsburgh storefront, the first of its kind in the United States. Many churches still taught that film was of the devil. Movies were downright controversial when the Kingman brothers chose to build Chelan’s theater. Surprisingly, it wasn’t the first movie house in town. That was located down the street in a vacant storeroom, with a flat floor and benches set around a portable screen. A young man named Harry Potter operated the business, which he called The Gem. Upon completion, the Kingmans signed a five-year lease with Potter, who closed The Gem to furnish and manage the new theater. He named it Ruby Theater after his foster daughter Ruby, and the original marquis sign, containing 48 lights, spelled out the name in bold vertical letters. The Ruby opened its doors July 1, 1914, smack dab in the era of early silent films. Each movie reel came with cue sheets that described the music to accompany individual scenes. Ruby Potter, age ten at the time of the opening, often played the music on a piano in the pit under the screen during the picture shows. The piano was eventually replaced by a photo player that used piano rolls (rolls with perforations) to play music to accompany the films. The person running the photo player could add other sound effects like gunshots, bells and drums, and sirens. 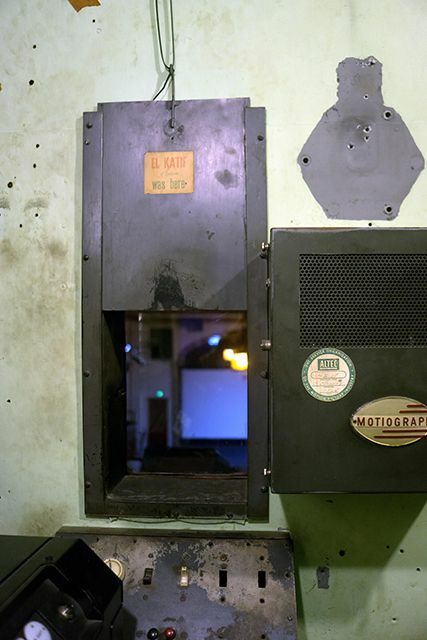 Early projectionists could also speed up or slow the film with a hand crank to build excitement or suspense. World War I added stress to the small venture. Potter, who was generally regarded as a mechanical genius, according to a newspaper article, broke the lease after four years and moved to Vantage, taking a job as a ferryman on the Columbia River and leaving the theater equipment behind. Ruby Potter met near demise in her new home. Late one night, three years after leaving Chelan, Harry Potter shot and killed Ruby’s mother. Then he tramped upstairs to kill 15-year-old Ruby. After she begged him to spare her life, Harry retreated down to his bedroom, where he lay in bed next to his wife and shot himself through the head, leaving Ruby alone in the house. Ruby’s fate after the murder-suicide was a mystery in Chelan for many years, until her granddaughter visited the theater in 2003. She told Hibbard that Ruby went to live with her aunt in Ohio after her parents’ deaths. She married, had two children and became a piano teacher in California. Ruby never shared the true story of her parents’ deaths with her children, instead, telling them they died in the influenza epidemic. She passed away in 1969. In 1919, a barber in Omak named R. A. Kelsey went home one evening and told his wife he wanted to buy the Chelan theater. The Kelseys moved to town with their children, and while building their home, they lived in the Ruby, in two rooms behind the screen and in the bathroom. Kelsey rented the theater from the Kingmans for $50 a month and eventually bought it for $9,000. They opened the theater playing “Poor Little Rich Girl,” starring Mary Pickford. Admission charges were 25 cents for adults and 15 cents for children. Kelsey installed two modern picture machines and a new Photo-Organ and added additional seats. 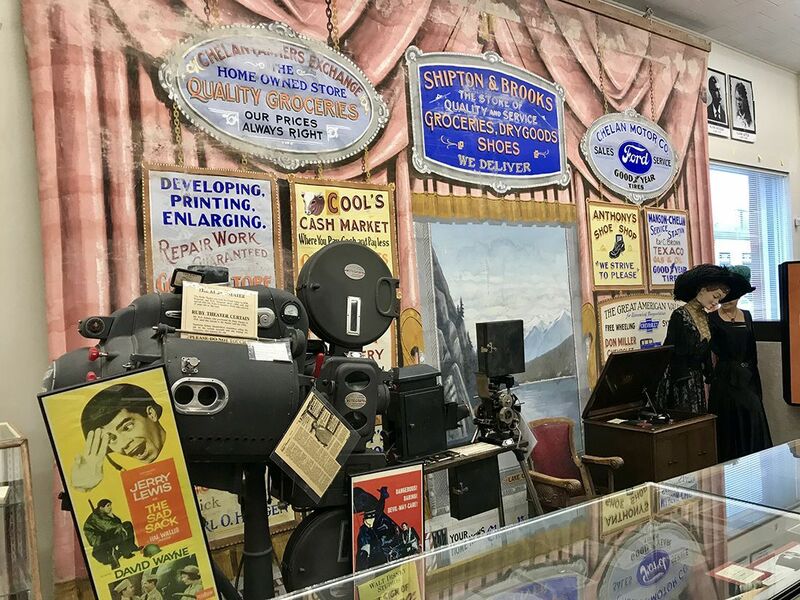 The advertising Oleo curtain used at the Ruby during this time is on display at the Chelan Historical Museum on Woodin Avenue. It was last painted about 1920, and a cream separator was used to roll the curtain up and down. Left: Mary Pickford stars in "Poor Little Rich Girl"
The original Oleo curtain was salvaged by Norm Evans He donated it to the local little theater group, the Apple Corp Playhouse in 1976. On March 19, 1930, the first talkie, a movie with sound, played at the Ruby. Called Sweetie, the film was described as a musical romance extravaganza of campus life. “It is all talking, dancing and singing and has an abundance of rib-cracking humor,” according to the management of the local theater, read the Chelan Leader. Tony Stokes, Leah Sluis and Dolores Holt, Hibbard and Fred Payne of Chelan have since owned the theater. Changes were made in 1947, when the owner installed higher intensity projector lights powered by a more powerful generator, upgraded the marquee and added a new screen, curtain and candy counter. But overall, the theater remains true to its beginnings, named to the National Register of Historic Places in 1991. The theater’s auditorium is essentially as it was initially constructed, with its original tin ceilings and tin facing on the balcony. One of only two privately owned history theaters in Washington state, the Ruby has continuously provided both movies and live entertainment since 1914, with just a two-year break from 1972-1974. In addition to films, the theater has played a central role in the community, the site of school graduations, community dramas, vaudeville shows, and other events. When the theater went up for sale in the late 1980s, Hibbard overheard a person on the sidewalk talking about buying it to convert to a shoe store. Hibbard wasn’t a movie buff. Even though he grew up in Manson, the only film he remembers seeing at the Ruby was West Side Story when he was in high school. But as an architect who appreciated the building’s historical significance, he wasn’t about to let the theater get dismantled. He made an offer that day, and he and Payne purchased the building on April Fool’s Day, 1989. Hibbard leased the theater to a manager for the first 25 years, but he and his wife Mary Murphy have operated it for the last four years. He bumped out the stage and added a permanent concession stand, as well as made improvements to the infrastructure, like heating and cooling. 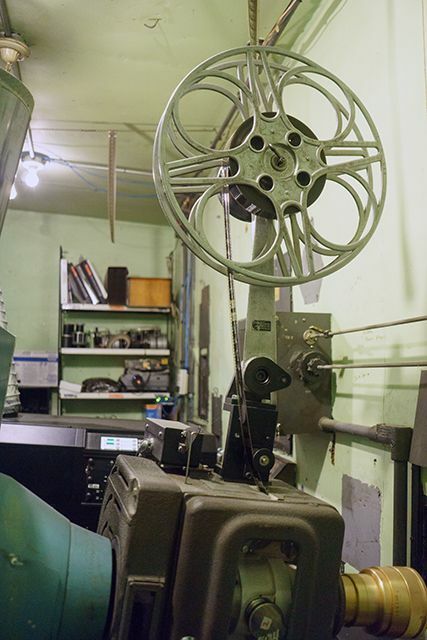 He replaced traditional film with digital projection in 2013 but maintains the theater’s old film projector (see photo), and leather chairs Hibbard added in the theater are vintage 1924 seats from the Christian Science church in Wenatchee. Hibbard’s orchard pruning crew painted the Art Deco style artwork on the auditorium walls on slow days. Manson artist Ron McGaughey helped create designs that reflect the era of early movie houses, and Larry made stencils and “paint by number” color codes for his workers.